Set the ground rules – be proactive. Show them where the team and the coaches will be seated. Make sure they understand that they must stay in that area. Most fields have a “coaching box” where they coaches need to stay during a game. Don’t let the coaches intimidate you. Give them respect and ask for respect in return. Remain calm. If someone is yelling at you, do not yell back at them. Speak respectfully and quietly, so the coach must quiet down to hear you. Do not take someone yelling at you personally. It happens to all referees, even the most experienced. However, once the coach steps over the boundaries of the game and begins to make his comments personal or abusive, you must deal with it. Slowly and calmly walk over to the coach. In a polite and respectful way, inform the coach that this type of conduct is unsporting and continuing with this type conduct will result in his or her removal from the game. If the behavior continues – respectfully and professionally ask the coach to leave. If the coach refuses to leave, give the coach a warning that if he or she does not leave, you will end the game. If the coach does not leave in a reasonable amount of time (a few minutes), end the game. Be sure to file a very detailed report with the league so there is a good understanding of why the game was ended early. Make your presence known from the moment you walk on the field – that way players know you are in charge. Stand tall, look people in the eye and smile confidently. Have your pre-game questions down – introduce yourself even if you have worked games with the same coaches before, ask for copies of the rosters, get the game ball from the home team and inspect it, check in players. (Do not tell players how you are going to call the game and what you are going to call and not call. This can cause you major problems later on.) Doing these game management things confidently will carry over into the game. If you have a difficult player dissenting or doing something else to disrupt the game, at a stoppage of play, issue a caution to them and let the player know that kind of behavior is unacceptable. If the player still insists on being difficult, use a well delivered warning to let them know that you have reached the limit of what you are going to take. It is often helpful to let the coach know this particular player is wearing out their welcome and the team may soon be playing short. Give the coach an opportunity to take care of the problem for you (perhaps by substituting out this player). If the bad behavior continues, issue a second caution and then a sendoff (red card). Remember that the proper procedure for this is to display the second yellow card and then the red. Listen to what players are saying. Allow them to vent for a few seconds without calling it dissent, so long as it does not become abusive or personal (however, if you are the referee, never allow a player to vent at one of your AR’s). You might find out about fouls you are missing, or there may be something else going on that can be easily corrected. This tactic also lets the players know you are willing to listen … up to a certain point. This type of exchange should not go on often in a game and should be very brief (for example, in the “heat of the moment”). If it goes on longer, you must deal with it. 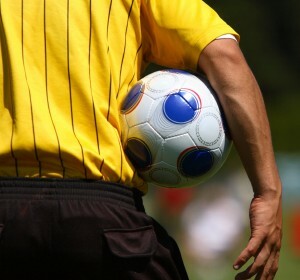 The more experience you have as a referee, the easier it is to know how, when, and where to set boundaries. Enlist the support of the coach. Ask him/her to speak with the offending spectators and let him know that, if the behavior continues, the game will not continue. This will usually be enough to quiet most parents (other parents may understand the consequences and help with the problem spectator). If you have asked the coach to deal with problem parents and the situation continues, ask the coach to have the spectator leave the area or you will dismiss them. If the spectator refuses, tell the coach that, if the spectator does not leave, the game will end. Give the coach a reasonable amount of time (a few minutes) to deal with the situation. All parents signed a code of conduct and you can dismiss parents as a last option; however, you should work through the coach or a tournament or league official first before dismissing a parent/spectator. If the parent does not leave, you should feel free to end the game. Include any misbehavior on the part of the spectators/parents in your game report to the WCSSF so that this type of behavior can be disciplined and stopped. Remember, you must include any problems in your game report, or the WCSSF cannot follow-up on it.